Are you having trouble finding ways to write about your family history? Would you like some ideas that will inspire you to write about pieces from your personal history? Family Tree Magazine has some very useful writing prompts that can help you get started. Family Tree Magazine is doing a May Memories Challenge. It is not a contest – and there are no prizes (other than the satisfaction one can get from finally writing down their memories.) They are issuing one new writing prompt every day during the month of May. The best part about the May Memories Challenge is that you don’t necessarily have to do it during the month of May. The ideas aren’t specific to May holidays. 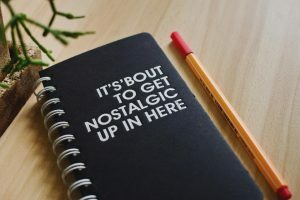 In other words, if you find the May Memories Challenge after the month of May is over – you can still use the ideas in your writing. That being said, those who are following along and doing the May Memories Challenge are asked to share their writing on social media using the hashtag #MayMemories. Type that hashtag into Facebook or Twitter, and you can see some examples of how other people used the May writing prompts. Family Tree Magazine points out that family historians tend to focus on researching their ancestors and recording their stories. This is important work, of course. The thing is that family historians tend to forget to write down their own stories and memories. It is well worth taking the time to write down your memories. Decades later, your descendants will be thrilled to “hear from you” in your own words. Some of the ideas from Family Tree Magazine are designed to evoke personal memories. For example, one prompt is: “What’s your favorite memory of your mom?” In general, people tend to get very emotional when they think of their mother – whether they got along well together or not. Writing down your favorite memory of your mom might be hard if she has passed away. It is important to write down that memory for two reasons. One, the memory means a lot to you and it will be nice to have it in a permanent format that you can read again when you want to. Two, the memory reveals things about your mother that other family members may not know. The story could include a song she liked, or a hobby she worked on when the kids were young.